Der Sportküstenschifferschein SKS Theorie Trainer entsprichtdemLernen mit Karteikarten. Bedienung: Für die Aufteilung derFragenauf Kästen stehen im Menü zwei Varianten zur Verfügung. 1.ZumLernen: Fragen auf alle Kästen verteilen. Zum Beispiel kanndasLernpensum pro Tag durch Auswahl einer Kategorie und einesKastengleichmäßig verteilt werden. 2. Zum Üben: alle Fragen indenmittleren Kasten. Durch Verschieben der Fragen beim Üben,wandernnicht gewusste Fragen nach links, gewusste Fragen nachrechts. 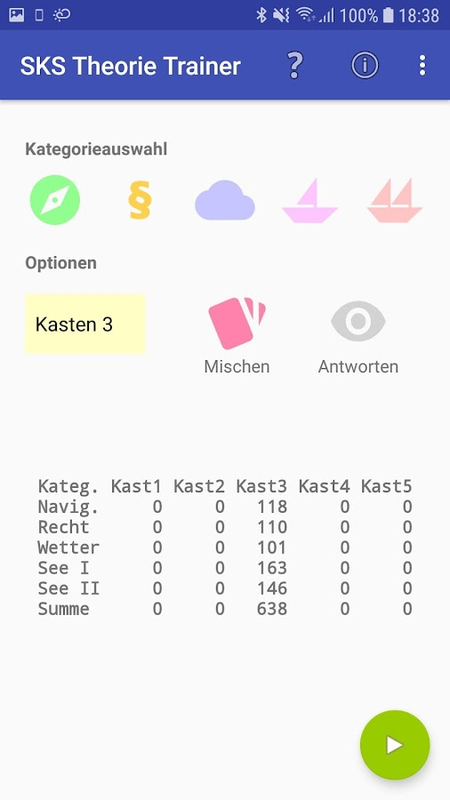 3.Um mit der App-Bedienung vertraut zu werden, lässt sichmit derMenü-Option "Test App" ein kleiner Fragensatz laden. 4. DieFragender Kategorien Seemanschaft I/II lassen sich durch Auswahldesentsprechenden Menü-Eintrags löschen. Auswahl der Fragenerfolgtnach Kategorie und Kasten. Durch Mischen werden dieausgewähltenFragen in einer zufällige Reihenfolge gestellt. ZumschnellenLernen lassen sich die Antworten einblenden. DasLernen/Üben wirddurch Drücken des grünen Buttons gestartet. DieFragen werden durchWischen nach rechts/links angezeigt. Mit denPlus- undMinus-Buttons werden die Fragen in den nächsten bzw.vorherigenKasten verschoben. Die Buttons sind so platziert, dasssie auch mitEinhand-Bedienung leicht erreicht werden können. DerText kannvertikal verschoben werden, so dass er nicht mehr von denButtonsüberlagert wird. Einzelne Fragen können gelöscht werden(Papierkorbrechts oben). Hinweise: Das Verteilen der Fragen auf dieKästennach einem Reset kann mehrere Sekunden dauern. DieausgewähltenKategorien und Optionen werden bei Übungsstartgespeichert und beimAufrufen der App wieder hergestellt. DieStatistik (Verteilung derFragen auf die Kästen) wird automatischaktualisiert. TheSportküstenschifferschein SKS theory trainercorresponds tolearning with index cards. Service: For thedistribution ofquestions on boxes, two options are available in themenu. 1. Tolearn: distribute questions to all boxes. For example,the learningamount per day can be evenly distributed by selecting acategoryand a box. 2. To practice: all questions in the middle box.Byshifting the questions while practicing, not knowing questionsmoveto the left, knowing questions to the right. 3. To becomefamiliarwith the app's operation, a small set of questions can beloadedwith the menu option "Test App". 4. The questions of thecategoriesSeamen I / II can be deleted by selecting thecorresponding menuentry. Selection of questions is done by categoryand box. Mixingputs the selected questions in a random order. Forquick learning,the answers can be displayed. The learning /practicing is startedby pressing the green button. The questionsare indicated byswiping right / left. Use the plus and minusbuttons to move thequestions to the next or previous box. Thebuttons are placed sothat they can be easily reached even withone-handed operation. Thetext can be moved vertically, so that itis no longer overlaid bythe buttons. Individual questions can bedeleted (recycle bin topright). Hints: Distributing the questionsto the boxes after areset can take several seconds. The selectedcategories and optionsare saved when the exercise starts andrestored when the app islaunched. The statistics (distribution ofquestions to the boxes)will be updated automatically. Es gibt drei typische Stromaufgaben in der SKS Prüfung. DieseApphilft bei der Überprüfung der zeichnerischen Lösung.Bedienung:Durch Auswahl des Stromaufgaben-Typs die zu bestimmendenWertefestlegen. Lösung berechnet die fehlenden Werte und zeigtdaszugehörige Vektordiagramm an. Mit Beschickung können KdW undKüGbeschickt oder vorher für die Stromaufgabe bestimmt werden.Hinweiszur Rechengenauigkeit: Die Ergebnisse sind gerundet unddieBeschränkung auf eine Nachkommastelle beeinflusst dieGenaugikeit.There are three typical current tasks in the SKS test.This apphelps to verify the drawing solution. Service: Select thevalues​​to be determined by selecting the current task type.Solutioncalculates the missing values ​​and displays the associatedvectordiagram. With charging KdW and KüG can be charged orpreviouslydetermined for the current task. Note on calculationaccuracy: Theresults are rounded and the restriction to one decimalplaceinfluences the accuracy. PLEASE NOTE: This app requires a Wonder Workshop robot - Dash orDot - and a Bluetooth Smart/LE-enabled device to play. Thefollowing devices are supported: Galaxy Note 10.1 Galaxy Note Pro12.2 Galaxy Tab 3 8.0, 10.1 Galaxy Tab 4 7.0, 8.0, 10.1 Galaxy TabPro 8.4 Galaxy Tab S 8.4, 10.5 Nexus 7 (2013) Nabi 2 Nabi DreamTabGalaxy S4, S5 All Android devices with Android 4.4.2 (KitKat) andabove and Bluetooth Smart/LE can download this app, but we cannotguarantee that it will work on devices not in the list. To find outmore, please visit us at: https://www.makewonder.com/compatibility.This app is FREE to play.------------------------------------------- Wonder makes roboticsas delightful as finger painting. With a picture-based language andguided challenges, Wonder is the first coding tool that lets kidsages 8 and up have fun with robotics all on their own. This appcomes packed with over 300 challenges that will teach you how tocode with Wonder, and you’ll be coding up a storm in no time.Travel through the African Grasslands, the Arctic Wilderness, andeven Outer Space in your coding adventures to uncover new ideas foryour robots. Turn Dot into a trumpet, a Pong arcade, or a desertrace drifter. Dash is a real robot that comes with you on all youradventures! Transform Dash into a ferocious lion, dodge asteroidstogether in outer space, play a game of Marco Polo together, andmuch more. When you and your robot are ready, start creating yourown inventions. Once you’re done coding, put your phone or tabletaway and your robot will remember your code. Wonder is the codingcanvas that gives you the joy of creativity as you bring Dash andDot to life. Roll up your sleeves, and push the boundaries of whatis possible. For ages 8 and up. HOW TO PLAY - Connect Dash or Dotto the Wonder app using Bluetooth Smart/LE - Update your robots!This app brings new sounds, personalities, and abilities to yourrobots. There’s a lot for your robots to learn, so the update maytake up to 20 minutes. Next time you turn your robot on, it willhave a whole new personality! - Use the controller to make Dash& Dot light up, move, and make sounds. - Venture on the ScrollQuest to complete challenges that will guide you on how to play andgive you fun ideas for your robots. Start with Dash or Dot - thereis a set of challenges for every kind of bot. - Collect BQ points.As you play the challenges with Dash and Dot, your robots gain BotIQ. The more BQ points your robot has, the smarter and morepowerful your robot is! - Try the Free Play mode to create your owninventions for Dash and Dot. - Transform Dash and Dot. Once you’redone coding, you can transfer your code to Dash or Dot. Next timeyou turn on your robot, it will run your code without beingconnected to a phone or tablet. If you have any questions orsuggestions, we would love to hear from you! Contact us at any timeat https://help.makewonder.com. ABOUT WONDER WORKSHOP WonderWorkshop, an award-winning creator of educational toys andapplications for children, was founded in 2012 by three parents ona mission to make learning to code meaningful and fun for children.Through open-ended play and learning experiences, we hope toinstill a sense of wonder while helping kids develop their creativeproblem solving skills. We play test with children throughout ourproduct and app development process to make sure our experiencesare frustration free and fun.